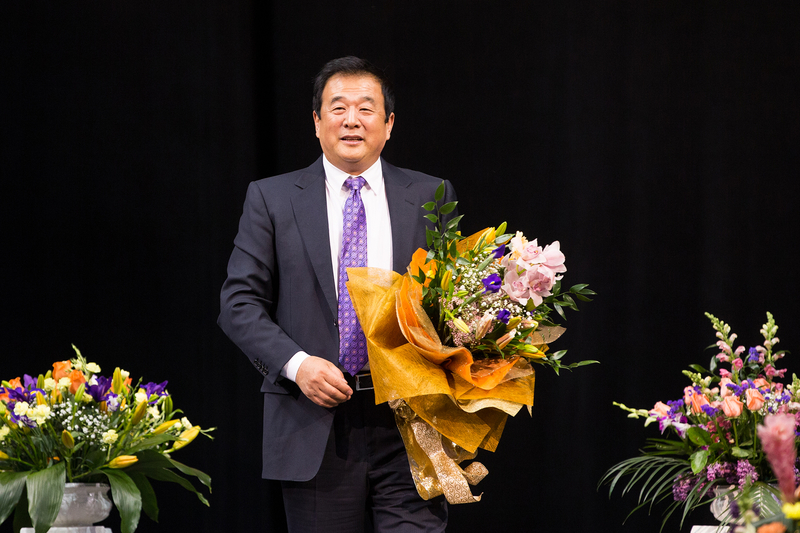 On May 14, more than 10,000 Falun Gong practitioners from 58 countries and regions gathered at the Barclays Center in New York for the experience sharing conference. It was the climax for the four days’ events to celebrate the 25th anniversary of Falun Dafa's introduction to the public. At around 2:50 pm, more than 10,000 Falun Gong practitioners stood up to welcome Master with applause. Master Li Hongzhi came onto the stage to deliver a lecture and answered questions for about two hours. Master also told practitioners to cherish time by doing the three things well in their own way. More than a dozen practitioners around the world shared their experiences on how to improve themselves by following “truthfulness, compassion, and forbearance” in their daily life. Mai He is a Falun Gong practitioner from Missouri. He served as an associate professor at a prestigious medical school in the United States after completing his Ph.D. degree and passing the board exam. He required himself to do everything well including housework, clinical practice, scientific research, teaching, Shen Yun promotion, and truth clarification to the local government. As a result, nothing was neglected. He has been a professional doctor with the most certificates in the hospital. He was invited to join an international Academic Committee. He also received an invitation to prepare an outline for the national resident. His professional association awarded him the highest honor of the year. He publishes three or four academic articles every year. There were several young speakers that day. Twenty-year-old Miss Yin came from South Korea. Currently, she works on TV program production and hosting. It was hard to imagine she was just a normal editor two years ago. From 2008 until now, she went from being a translator to becoming an experienced director and host. She talked about the hard progress behind filming interviews with stars. Initially, she doubted herself, complained about others, and was scared of not being photogenic. She wanted to quit and cried every night alone. Later, Master showed her the predestined relationship between those stars and her in a dream. She could feel that they wanted her to save them. Thereafter she never thought about quitting but instead prepared interviews until midnight. Miss Yin always did truth clarification to those brokerage firms first with righteous thoughts before setting up the interview with those stars. She tried to promote the positive culture by excluding the variation from modern society in the program. With a pure mind, she interviewed more than 30 stars and celebrities inside or outside South Korea. They were not easy to be interviewed, and avoided invitations even from the Korean mainstream media, or royalties. Huiqiang Fan was a practitioner from Australia. He had smoking and alcohol habits for a long time. However, it only took him few hours to get rid of those habits after learning Dafa. He shared his experience about looking inward and improving Xinxing. He said he got angry easily during his early cooperation experiences. He looked inward repeatedly and put down the attachment to self. Now he realized as a cooperator, he could cooperate with others as well. Then everything became well. He also said that he could feel Master’s compassion several times in the process of looking inward. Each time, he was full of tears. After learning Zhuan Falun, he realized, “As long as you look inward, you can always find your own attachment. No matter what condition you are in, never try to change others and instead change yourself. Now I always look at myself first instead of at others.” He also found that bad things would disappear after he changed. New Jersey practitioner Cai Yi did security work during Dafa activities. His daughter reminded frequently that he lacks compassion, but he did not take it seriously. Once, Cai Yi asked his daughter what kind of job would be better for him. His daughter told him to be a policeman. He was surprised because he had been a scholar and had nothing to do with police. When he asked for a reason, his daughter said it was because he enjoyed catching bad guys. He was so shocked and wondered how he could leave such an impression with his daughter. Children and fools speak the truth. He looked inward and realized he should be kinder. Later, Cai Yi could always explain the activity rules kindly when he served as a security officer. Most people were pleased to accept and cooperate. He realized that compassion was more powerful than coercion. A lady practitioner from Germany shared her experiences clarifying the truth to the Chinese tourists. She said she met all sorts of people: some were positive about Falun Gong, while others refused to listen. She said the process of truth clarification was like “wandering”. During that process, she let go of the attachment to losing face and dealt with it righteously. “I always remember Master’s teaching of keeping righteous thoughts and being kind to others”, she said. “I use a peaceful tone, trying not to trigger the negative side of others. After eliminating their precautions, I will talk to them by coming from their points of view.” She said she knew how to restrain herself and eliminate the attachment of competitiveness. Gradually, the environment changed, and the interference lessened. It was Dafa’s power. Falun Gong can make people healthy. Seventy-year-old Dafa disciple Helena Cheng was from New York. In 2000, Helena Cheng broke her left foot and was told the recovery process would take at least half a year to one year. However, after participating at the Falun Dafa Conference in New York, her foot fully recovered and was even better than before. She began cultivation ever since. Helena Cheng started to distribute the English Epoch Times to the government and officials since 2004. From initial cold reception to later friendship, she experienced lots of touching stories. She then began constantly receiving rewards from Congressmen. Her cultivation improved accordingly. “Day by day, year by year, in addition to the government officials and their assistants, I did truth clarification to everyone including staff, interns, guards, officials, voters, and visitors as long as I met them.” Cheng said. “This congressman is the one who raised the Falun Dafa Day last year and this year", said Helena Cheng. At the World Falun Dafa Day, more than 100 government officials at the New York State Government honored the 25th anniversary of Falun Gong. The New York State Senate also passed resolution 1432. Master’s appearance encouraged practitioners. All practitioners benefited from the experience sharing exchange during the conference. It was the first time for mainland practitioner Yanping Han to participate in the conference. She arrived in the US ten months ago. She was so touched and could not express how excited she was. Eight-year-old Lisa Pang has practiced with her parents since she was born. She said she came to learn about others’ experiences today. Her only wish was to see her dad. Lisa’s dad Guangwen Pang has been imprisoned for five years in Shanghai because of truth clarification to his University classmates. He still has not been released. Ms. Sylviane Scarba came from Silicon Valley, California. She said she was so happy to participate in the largest Fa conference this year. It was the most beautiful and moving event in which she has ever participated. She could feel the true hearts of the Falun Gong practitioners. Over the past few days, more than 10,000 Falun Gong practitioners from 58 countries and regions had a series of events in New York to celebrate the 25th anniversary of Falun Dafa being introduced to the public. They had a thousand-person rally, practiced together, created a large-scale character, and held a parade. People from the world praised the activities with "beautiful", "spectacular", "shocking", and "moving"! Mr. Li Hongzhi introduced Falun Gong in Changchun, mainland beginning on May 13, 1992. Now it is welcomed by people in over 100 countries around the world. In the face of eighteen years of continuous persecution by the CCP, Falun Gong practitioners have always followed the teachings of Master Li: "truthfulness, compassion, and forbearance". Now, more and more practitioners participate in each year’s activities, and they become even stronger. Many practitioners promised to meet again next year!